Augmented Reality May Be the iPad 2′s Secret Killer App http://www.fastcompany.com/1738956/augmented-reality-possibly-the-ipad-2s-secret-killer-app // physically explore virtual worlds? Potential! 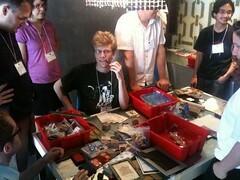 At ARGFest 2010, the Artifact Creation 101 workshop gave a hands-on experience creating memorable and relevant story items, “artifacts”. There is great benefit to expanding a story into the real world for the audience through physical props and artifacts.